GRANADA HILLS.–The real shame of Wednesday night’s opening round of the CIF State Div. II playoffs was that one of the two teams – both of whom earned a spot in their respective Southern Section finals – would have its season ended by the close of the night. It would also spell the end of a brilliant prep career, that of either Century City senior Taylor Tanita or Granada Hills’ Kristi Nishida. The matchup was a classic of high school competition, with two evenly-matched teams playing in top form and seeming to grow in determination as the game progressed and the pressure increased. In the end, it was Granada’s Highlanders who escaped with a 49-46 overtime win to advance to Saturday’s quarterfinal game at Lynwood. The girls of Granada Hills apparently feel right at home playing in OT; they’re 6-0 when the game goes into extra time. Midway through the second quarter, Granada High went on a 6-0 run to make the score 22-13, but Culver City turned around and put together a 7-0 run. With 0.1 seconds left, Culver City’s Kailey Tooke was fouled and made both free throws to send the teams into their locker rooms tied at 24. After the half, Granda Hills came out firing and jumped out to a nine-point lead, but Culver City junior Kelsey Ueda began to find her touch and the Centaurs answered with a 6-0 run. Tanita’s runner at the end of the third missed the mark, leaving the score at 35-34 in favor of the Highlanders. Culver City had a fair amount of trouble with Granada Hills center Danielle Ward, who was strong inside and finished with 15 points and a game-high 19 rebounds. The Centaurs, however, had a counterpoint for everything the Highlanders threw at them. “We weren’t supposed to be anywhere close to this,” Tanita said in praise of her team’s season. With 33 seconds left in regulation and the game tied at 42, Tanita calmly dribbled as time ticked away, sized up her shot and lofted a 15-footer from the top of the key with 14.2 seconds remaining, but Nishida appeared to get a fingertip on the ball and the shot fluttered left. With the chance to win now in Granada’s possession, Nishida drove to her left with 4.7 seconds left on the clock, but her off-balance shot taken around Tooke missed the rim and the teams were headed to overtime, tied 42-42. The defense on both sides was superb, with neither side willing to yield. A full minute and a half went by in overtime before any points were scored. Granada’s Jenny Cuadra hit a three-pointer to give the Highlanders a one-point lead with 56 seconds remaining, and inside of 10 seconds, Culver was forced to foul. Down by three, the Centaurs still had a chance, and they got the ball into the hands of Tanita, whose buzzer-beater that propelled her team into the Southern Section final was still fresh in the minds of the Culver City faithful. This time, however, there would be no magical ending for Tanita and the Centaurs. After clearing herself for a three-point shot from the right side of the key, Tanita launched a clean shot over the outstretched hand of Nishida, but the ball clanged off the back of the rim as time expired. Tanita finished the night with 15 points, Tooke had 16 and Ueda added eight. Nishida, who had eight for the Highlanders, said Culver City simply refused to let up. “Every time we pulled ahead, Taylor or [Tooke] would make a shot, and they were even again, so it was tough,” she said. Adding to the drama Wednesday was the fact that Nishida and Ueda are teammates on a club team. Friends off the high school court, Kelsey Ueda and Granada’s Kristi Nishida share a laugh after the first-round win by the Highlanders. Tanita and Nishida are no strangers either, having played against one another in JAO and other leagues. Ueda, the Centaurs’ team captain who will be a senior next year, agreed that the schedule meant heartbreak for one side, and since it’s her team that goes home, they’ll focus on improving. Tanita, who this fall will attend UC San Diego and join the basketball team there, said while the loss was a disappointment, she couldn’t be more proud of this season’s Centaurs. “We lost 10 seniors from last year, so we weren’t supposed to be anywhere close to this, so I’m just happy with the way our team came together,” Tanita explained. In another Div. II contest, Alyson Lock scored 22 and Mark Keppel slipped past Monroe, 49-44. The Lady Aztecs will have a rematch Saturday at JW North, who knocked Keppel out of the Southern Section playoffs in the semifinals. In the Div. III opening round Wednesday in San Diego, Kristy Omura and El Dorado had little difficulty with host Our Lady of Peace, 74-48. The Golden Hawks rematch Saturday night with Agoura, who knocked El Dorado out in the Southern Section Div. 3AAA semifinals. In Div. IV, Coco Miller torched the nets for 26 points as JSerra topped Mater Dei Catholic, 60-52. JSerra was set to host St. Paul on Saturday night. 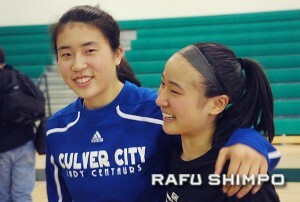 Bishop Montgomery’s Kate Tokuhara scored 12 points and Nao Shiota added nine in a Div. IV 67-61 overtime loss at Bishop’s. In Div. 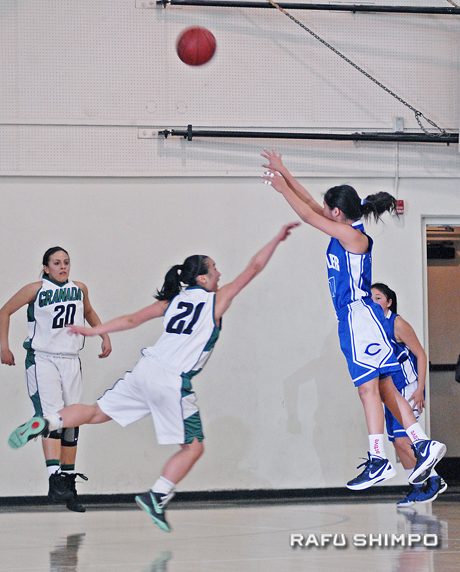 V, Kristie Kawamoto had two steals and an assist in Providence’s 42-29 victory over visiting Tri-City Christian. Saturday, Providence will travel to meet Sierra Canyon in a 7 p.m. game to be played at Chatsworth High School. Also in Div. V, Flintridge Prep got 10 points from Maya Okamoto, but the Rebels were eliminated by Immanuel, 53-46. 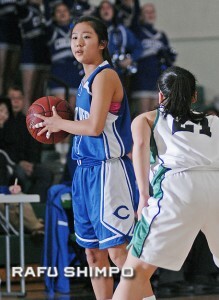 In the Open Division, Brianne Yasukochi scored seven for La Jolla Country Day, who roughed up visiting Troy, 51-31. Cori Okada scored two for Troy in the loss. On Tuesday, Country Day will face Courtney Jaco and Windward, who had a bye in the first round. Also on Tuesday, Mater Dei, with Anela and Kau’i Miki-Han travel to Gardena Grove to take on Santiago. On the boys’ court on Friday, Jamie Kobayashi and Mater Dei took care of business in the Open Division, socking El Camino Real, 79-54. Mater Dei next faces Long Beach Poly on Tuesday. On Wednesday, Palisades junior Louis Kurihara led his team with 21 points in a thrilling 72-70 Div. I win over host Mission Viejo. Paliades travels to Santa Monica Saturday in the second round. In Div. V, Colton Oshiro and Trinity Classical moved on to the second round with a 63-49 win over Tranquility. Trinity hosts Horizon Saturday at 7 p.m.
Phillip Cox had 13 points and Dean Tanioka added four, but LACES fell in the first round of Div. V to Crespi, 77-61. Southern Section champion Rio Hondo Prep stumbled in the first round of the State tournament, falling 65-61 against Foothills Christian. Cody Hiroto scored four for Rio Hondo. Also ousted in Div. V Wednesday were Robert Cartwright, Kyle Hamane and Flintridge Prep, who dropped a 60-51 decision to Village Christian.